Post Singapore, What is Next for Freedom in North Korea? Yesterday in Singapore the on-again/off-again summit between President Trump and North Korea leader Kim Jong Un made history as President Trump became the first U.S. president to meet with a North Korean leader. The focal point of the carefully planned and choreographed summit was the private meeting between Trump and Kim where the discussion focused on bringing North Korea out of the dark age of a repressive regime pursuing nuclearization into the modern world. While all the details of their discussion have not been disclosed, we do know there is finally a solid verifiable path forward for the United States, North Korea, and the world. 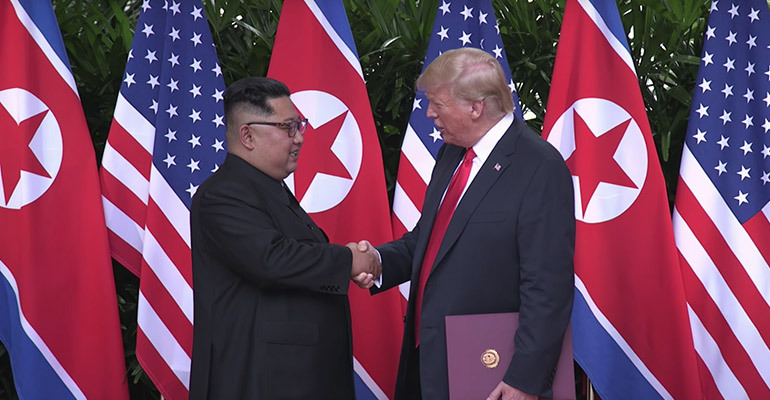 An agreement in which North Korea affirmed that it will work toward complete denuclearization, and in exchange the United States committing to helping North Korea prosper and ensuring its security. While the United States has achieved an important milestone in the pursuit of the denuclearization of North Korea, the details and specifics are yet to come. What are the next steps? What incentives will the U.S. provide? What changes beyond dismantling their nuclear program will Kim have to make? All of those details will most likely be hammered out in subsequent meetings overseen by Secretary of State Mike Pompeo. I am confident, based upon my conversation with Vice President Pence yesterday, that the United States will ensure that religious freedom and human rights are substantively integrated into that process. Photos and smiles aside, North Korea under Kim is one of, if not the most repressive place on the planet, as our own government has recognized in the State Department’s 2017 Religious Freedom Report. North Korea keeps an iron grip on any worship which could alter the state’s power, promoting in place of religious freedom what is akin to a state religion worshiping the “Great Leader” Kim Il-Sung. The experiences of North Korean Christians are such that when freedom opens the door just a crack, it is violently slammed shut by the government. The research makes clear and the Trump administration understands, that the only path to true cultural, political and economic long-term stability in North Korea is for religious freedom to provide the foundation. Thankfully, we have already seen the impact that U.S. prioritization of religious freedom can have. After President Trump pointedly raised religious persecution in Nigeria with that country’s president, additional security forces were immediately deployed to vulnerable areas upon his return. While North Korea is different by orders of magnitude, the Trump administration must clearly and directly confront the issue of religious freedom. If religious freedom is not dealt with, North Korea will not be able to economically move into the modern world anyway (something it seems to want to do), and the North Korean people will be deprived rights which derive from their very humanity and creation in the image of God. What makes this North Korea summit different from others that have failed? As our own General Jerry Boykin shared with me on Washington Watch, the summit approached the matter by allowing negotiations at the top, with the leaders meeting and committing to the end goal of denuclearization, leaving subordinates to work out the details. Usually these meetings develop from the bottom up, as did Secretary of State Kerry’s negotiations over Iran. This doesn’t mean we should be naive. As the General (who with decades of traveling the world in defense of U.S. interests, is no stranger to the skepticism one may develop about world affairs) recognizes, “[w]e need to let Kim know that we consider his nuclear program an existential threat to the United States and are willing to use all available means to oppose it.” At the same time, the implicit threat in this message constitutes the very pressure which will get Kim to the negotiating table and cause him to think twice before walking away from working with the United States. President Trump deserves a great deal of credit for the way he has handled this summit. What many haven’t seen is the private diplomacy between the United States and China leading up to the summit, which ultimately resulted in China supporting the general concept of North Korean denuclearization. Moreover, in no small way, the president’s recent withdrawal from the Iran deal played a part in moving the ball forward with North Korea. With that one act of U.S. withdrawal, Kim at once knew two things: he would not get a weak deal with the United States, and the United States would not accept another nuclear-armed state—whether Iran or North Korea—that threatens us or our allies. Yesterday’s summit was a milestone, but the journey is far from over. Please continue to pray for a peaceful resolution to North Korea’s nuclear build up and for the persecuted that remain behind the walls of North Korea that freedom would soon come to them.